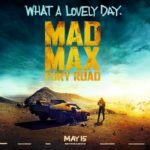 Starring John David Washington, Adam Driver, Laura Harrier, Jasper Paakkonen, Topher Grace, and Ryan Eggold. 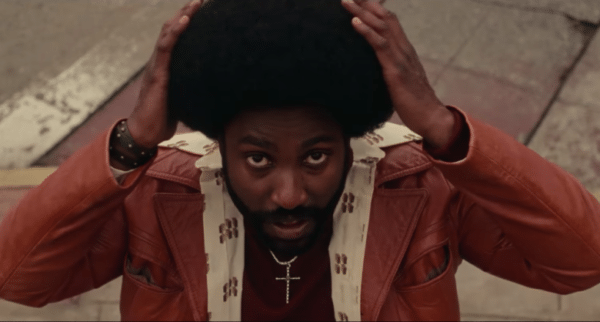 Ron Stallworth (John David Washington) is an African-American rookie cop on the Colorado police force, who manages to infiltrate the local chapter of the Ku Klux Klan, using his partner Flip Zimmerman (Adam Driver) as the face of a ground-breaking operation. 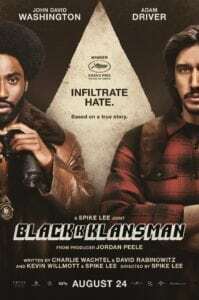 Spike Lee joints have always bristled with societal discourse to support a strong narrative, but with BlacKkKlansman it feels like so much more, because not only is it a remarkable true story based on the memoirs of an undercover cop, but it resonates in such a gut twistingly real way, that its impact shouldn’t just be the immediate horror, but an indelible one that holds a mirror to a world in which the cracks keep on getting bigger. At it’s core is the story of a rookie cop, Ron Stallworth (John David Washington), the first black man on the Colorado Springs police force, who accepts a job in the records room, despite being made aware of the race ramifications involved. He’s confident in his ability to handle the abuse, being a man whose “parents raised him the right way”, so it’s no surprise when he’s quickly assigned a detective role. It’s here that he signs up to a local branch of the Ku Klux Klan over the phone, or as they like to call themselves, “the organisation”. The obvious stumbling block see him partnering up with Adam Driver’s seemingly reluctant office, who acts as the face of their operation to take down the cross-burning hatemongers. BlacKkKlansman is a near perfect hybrid of comedy, police procedural drama, horror, sermon, and warning. The levity is the most prominent, especially early on in proceedings. It’s used to make you warm to characters, or in the case of the Klan, undermine them by imbuing members with a level of stupidity. The most successful elements are the barbed asides to the current world order – “politics is another way to sell hate” – which is sometimes sledgehammered home, but is an integral part of why Spike Lee’s rally cry is so affecting, long after the credits have rolled. Just as impressive is the use of screen scorching imagery and scene construction; take the juxtaposition of a story being recounted about the lynching of a young black man, while at the same time the Klan are holding a post-initiation screening of D.W. Griffith’s hate-fuelled 1915 film, The Birth of a Nation. The two threads are expertly woven, the stories intrinsically linked, and both are as disgusting as each other. It’s as powerful as filmmaking gets. Reinforce that with haunting frames in which Washington stumbles upon a Klan shooting range at which the targets appear to be black people running away, and you have a film which stirs the tear ducts as well as the grey matter. Washington is fantastic as our way in to this world, the perfect mix of confidence – “I can dig it” – and a naivety which makes him extremely likeable. His telephone exchanges with Topher Grace’s Grand Wizard are a highlight peppered throughout the film, veering from comedic to downright scary. He also shares a believable, three-dimensional romance with Laura Harrier’s activist, and his one-two with Driver is layered, their conversations sparse but revelatory, never descending into the kind of cliché you might expect from this scenario. BlacKkKlansman is Spike Lee’s most impressive joint to date, presenting the kind of rhetoric which has echoed through the decades, positive and negative, and punctuating it with a final fives minutes that will hit you in the solar plexus and the heart. It’s a distress call, a statement of hope, and a damn fine film.